Where there is smoke, there could be fire! Wildfires can occur anywhere, any time of the year, and destroy homes, businesses, and natural resources. According to the National Fire Protection Association’s Firewise Communities Program, more than $1.9 billion was spent on wildfire suppression in 2016. Watching the Federal Emergency Management Agency’s wildfire animation – When the Fire Starts. Reviewing your homeowner’s or renter’s insurance policy to ensure you have the adequate coverage for your property and personal belongings. Removing flammable items, such as firewood piles and portable propane tanks, within 30 feet of all structures and discarding any dry or dead vegetation from up to 100 feet around your home. Learning and practicing evacuation routes from your home or business to an area that is not affected by the wildfire. The best action to protect yourself and your family is to evacuate early and avoid being trapped. Wildfires can occur any time of the year, but are especially prevalent during the dry season. Make sure you prepare ahead of time by checking out Prepareathon's How to Prepare for a Wildfire Guide. Have you heard? National Parents’ Day is Sunday, July 23. In observance of this occasion, we encourage family members to help parents prepare for emergencies. Prepareathon and the Ready Campaign highlight several ways to prepare for the unexpected. Creating a family emergency communication plan - Your family may not be together when disaster strikes, so it is important to plan for how you will connect with each other. Preparing infants and young children for emergencies - Learn the emergency plans for their daycare or school. Getting college-age kids Campus Ready - Gather information on the emergency procedures for their school or dorm. Practicing your emergency response plan - Making emergency plans is great, but practicing your plan by conducting drills will help your family’s response time when seconds count. Disasters can be stressful for kids. Try to make emergency planning fun for children in your family. Visit www.ready.gov/kids for exciting games, quizzes, and other resources to help young children and teens understand the importance of emergency preparedness. The 27th anniversary of the Americans with Disabilities Act is Wednesday, July 26. Individuals and caregivers for people with disabilities and others with access and functional needs are encouraged to evaluate their necessities in the event of an emergency and create an emergency plan unique to them. Collect information – Create a paper copy of the contact informationincluding phone, email, and social media information for your family, friends, caregivers, neighbors and other important people or service providers. Share your emergency plans – Tell your employer and trusted people in your support networks where you keep your emergency supplies, what you need, and how to contact you if the power goes out. Practice Your Plan – Dedicate time to practice your emergency plan with your support network, just as you would with a fire drill. 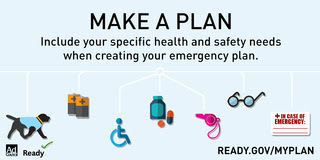 For more great information on how to make your emergency plan, visit Ready’s Individuals with Disabilities page. On Tuesday, July 18, the Federal Emergency Management Agency’s (FEMA) Youth Preparedness Council (YPC) members conducted broadcasts on Facebook Live during 2017 Youth Preparedness Council Summit in Washington, DC. If you missed the live streams from the Koshland Science Museum or the National Portrait Gallery, it’s not too late. The videos are still available on Prepareathon Facebook page. Koshland Science Museum - Tune in for a behind-the-scenes look at how YPC members handle disasters in the museum’s Extreme Event game. National Portrait Gallery – Watch YPC members discuss their preparedness projects. To learn more about FEMA’s YPC, please visit: www.ready.gov/youth-preparedness-council.